A strong, reliable, portable jump starter is an essential part of any motorist’s kit. The best devices can sit in the car until needed and provide a quick, simple charge in times of trouble. Yet, there is a big difference between the best and worst devices. At their best, even the most inexperienced users should be able to operate them without any concerns. At their worst, they can be cumbersome, temperamental and confusing. There are different types of models out there with different functions. It helps to understand precisely what you want from one of these machines, and what their features actually mean. Some of the most important features to look out for with top rated portable jump starters. 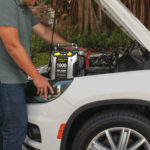 There are a few different approaches that brands can take when designing a jump starter for commercial use. 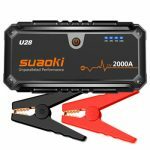 First of all, there are those that focus purely on the battery, amperage and clamps for a reliable jump starting performance. This single-purpose machines are tough and should be easy to use. The best will have all the right safety features, displays and a light enough body. Then there are the charging units and power packs that combine car jump starting and charging electronic devices. Here buyers need to look for the battery power, outlets and adaptors, as well as the features above. Then there are the devices that aim to provide something even more multifunctional. Some will add in flash lights, air compressors and other tools. Here it is important to look at the full specifications. Are designers throwing together lots of low-grade elements, or is this the full package? Decide how much you really want this device to do. There is no need to over-complicate matters if all you want is the jump starter. Still, these tools could come in handy for those that are a little cautious. 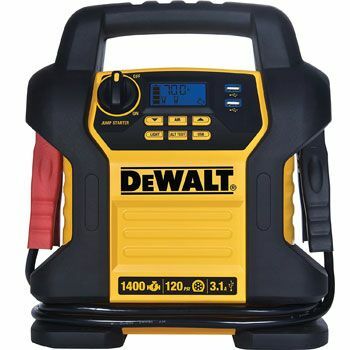 Top rated portable jump starters that focus solely on getting the vehicle up and running. 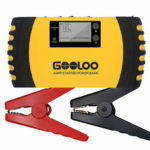 Those that don’t want all the fuss, hassle and extra weight of multifunctional devices can stick with the streamlined sole-purpose jump starters. There are some devices here that are surprisingly compact, and others that look a lot like the old fashioned model. This Jump-N-Carry device is somewhere in the middle. It has the shape and style of the devices we are familiar with, but isn’t that heavy or difficult to handle. It still has a tough casing and heavy-duty feel, with the #2 AWG cable leads and the industrial grade clamps. Yet, it is also fairly light and portable at 18lbs. 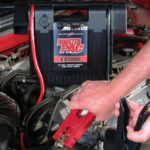 This device is all about reliable jump starting with nothing but the right tools. There is enough power behind the system to handle all types of passenger vehicles and light commercial vehicles. The clore proformer battery has a long life and great performance, with the additional bonuses of the charging status indicator and voltmeter. Now we move onto those devices that bring in additional charging elements. 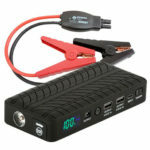 It is common now to find power packs for jump starting and charging electronic devices. Users can place their phone, tablet or laptop on the passenger seat, attach the charging unit and recharge devices on the way home. This Schumacher SL65 is one such device. It has a USB port for mobile charging with smart cable protection against reverse charging, reverse polarity and more. The 8,000mAh lithium battery is strong enough to handle most needs. This charging ability is a great selling point, but there is still that ability to charge vehicles. The device comes with the promise of 20 jump starts per charge. It is also a pretty compact device, compared to some models in this guide, and comes with a soft touch finish and durable travel case. The final model in this list of top rated portable jump starters does things a little different. Here there is a sense of designers trying to play around with ideas and features. With some brands, this experimentation might not work. There is the chance that they could focus on pointless gimmicks and compromise on quality. That does seem to be the case with this model. Here the main focuses are the jump starter and charging elements, but there is also a compass to help with navigation. This is a neat extra for those stuck on the roadside in unknown locations. This odd selling point doesn’t detract from the power and purpose of the machine. 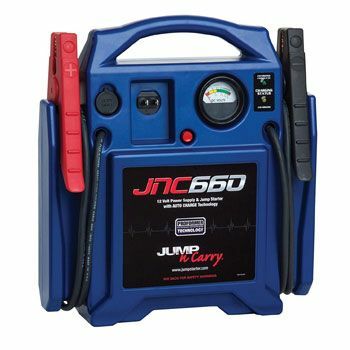 The jump starter has intelligent clamps, and 600 amp peak power for 6.5l gas ad 5.2l diesel engines. The electronics charging comes from an 18000mAh battery, with an additional 9-in-1 laptop adapter. The different modes with the flash light function above highlights a possible issue when buying these multi-functional devices. There are some brands that offer 3-in-1 models that really do have three different purposes. Some of these are mentioned below. Then there are those that try and deceive users a little. The sales pitches for this GooLoo model are a little misleading. They talk about 4-in-1 functionality, but one is the flash light, and one is the strobe light. The light source is effective, but this is not a main feature. 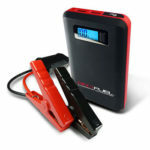 Still, there is plenty of power and potential in the other two components – the jump starter and the charging device. The system has 1000 amps of peak current through heavy duty clamps. This is higher than many of the models in this guide, and should allow for 30 jumps per charge. Then there is the 20800mAh capacity battery to charge mobile devices via dual USB ports. These dual charging devices always work best when they have the best possible battery and charging capabilities. There are some brands that add in a weak battery and one USB port to appease consumers, but this doesn’t always do the job. Here Schumacher have pushed further with improved capacity and outlets. There is a powerful lithium ion battery in this Red Fuel model, with ports for USB, micro USB and lightning cables. This provides a greater range for users with multiple devices. Meanwhile, the jump starter system can easily handle 4-6 cylinder cars and motorcycles. The other important selling point here is the look and size of the device. It is small and slim, especially compared to the tough clamps that come with it. This means that it can sit on the passenger seat, and store away in a glove compartment, with no worries at all. 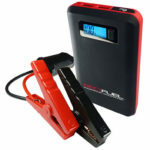 Then there are the jump starters that go beyond 2-in-1 charging capabilities to try and provide something even more helpful to users. The aim here is a more complete experience for roadside assistance. One way that companies like to do this is with an air compressor. 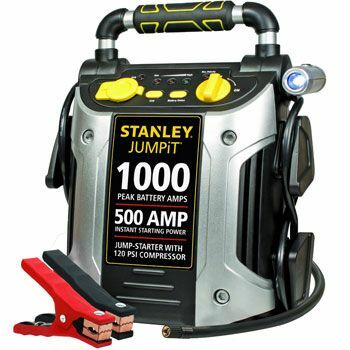 This Stanley model offers a 120 PSI Air Compressor for flat tyres, in addition to the 1000 peak amp jump starter and the USB charging outlets. This powerful compressor doesn’t add too much weight to the product. An added bonus with this model is the sense that this is a safe, easy-to-use machine. This is important for those that want the very best experience. There is an alarm system that warns users about reverse polarity, a back-lit gauge on the compressor and a rotating LED light. The latter is ideal for night time issues. Some of the best models in dual purpose charging devices are those with new features and upgrades to improve the user experience. There are many devices out there are try and offer lots of features, but stick with basic forms and few additional considerations. This Rugged Geek model is different, which is no surprise from this respected brand. Here the manufacturers have tweaked the charging system for their 2018 RG600. It now includes micro USB charging so it can handle a wider range of devices. There is also the laptop port and an LCD display that gives information on the charge levels. Of course there is also the powerful jump starting potential to this device. Here users can enjoy 600A of power via “risk-free” jump starter cables. There is also an LED light with different models for illumination and signalling for help. This Booster Pac device is another model where the priority is to provide a clean, quick jump start with minimal effort. There is no messing around with this specification. It is stripped back in terms of features, but not when it comes to the power offered. This device can deliver as much as 1500 peak Amps and 400 cranking Amps of starting power. This should be more than enough for most cars and family needs. But, there is also the idea that this will be a great commercial tool for professional situations. Once again, the designers of this device aim to provide great peace of mind to consumers. They do so with the high quality components and strength of the machine. 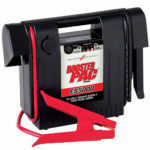 This device has a tough, impact-resistant casing to protect the jump starter from rough handling. There are also heavy-gauge 43″ #4 AWG cables and industrial grade hot jaw clamps. Add in the corrosion resistance and high-tension springs and this is an impressive build. These devices that are charging devices as well as roadside assistance work best when they balance high performance, multiple features and safety precautions. 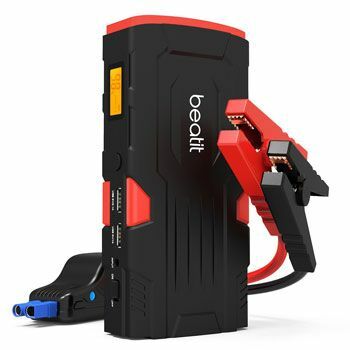 This Beatit jump starter is one such device. This is a powerful 800A jump starter with an 18000mAh power bank. It should be able to handle gas engines up to 7.0L and diesel engines up to 5.5L – which gives it potential with boats and trucks. They claim it can handle 30 jumps on one charge. The power pack has a series of USB ports with the promise of quick charging capabilities. Buyers can use both with ease thanks to the dual LED flash light. Users of this device can also appreciate the compact size and the different safety features. The smart clamps detect issues such as reverse polarity, power surges and short circuits. They will shut the connection down if deemed unsafe. This Dewalt device is another multi-functional top rated jump starter from a leading brand. Here there is once again that 3-in-1 approach. 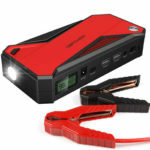 There is the 1400 peak amp jump starter, which motorists can use with ease on vehicles up to V8 models. Then there is the electronics charger with two 3.1 amp USB outlets for phones and tablet. Finally there is the 120 psi air compressor to help users inflate their tyres. This is another model where the designers have considered the needs of less experienced users. One concern with multi-functional devices is that they will be too complex, leading to errors and handling issues. This shouldn’t be the case with this DXAEJ14 because of the readings and gauges. There is an LCD screen for information on the charge and performance, secure clamps with charge protection, as well as a surefit nozzle on the compressor. Choosing from the best top rated portable jump starters for secure roadside assistance. There is a lot to consider here with these top rated jump starters. At the beginning of this guide, we focused on the differences in functions. This is clearly the easy way to differentiate between these models. There are those jump starter with the sole purpose of starting cars. This single focus means that there is a greater emphasis on the power and quality of the components. But, even then, there are differences between the models. The materials used, the amps produced, the size of the device and the case can vary from brand to brand. With the other devices, there is that focus on multifunctionality. The aim here is to provide as many tools for roadside assistance as possible. Again, it is clear that this goes beyond the individual component. Each model uses different ports, light settings and design features. 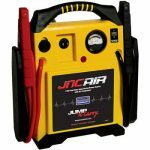 This is why it is important to compare and contrast the best jump starters for the best purchase. Choosing by function isn’t enough. Once you are clear on what you want the device to do, you can then look at the details in the specification. The fine print and small differences in figures make a difference.